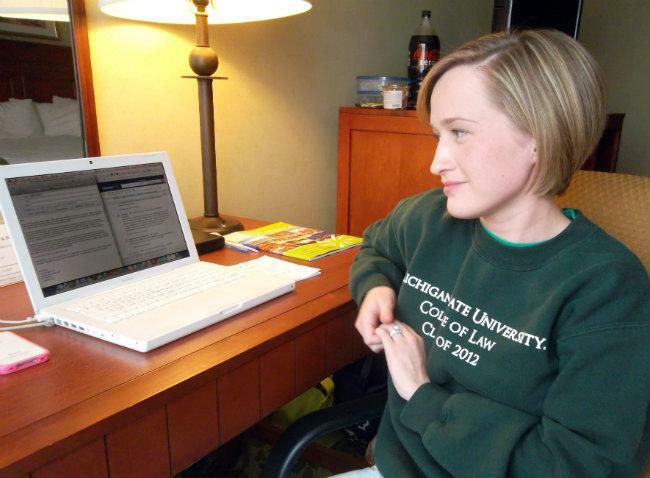 Sheila Eddy's home office has been relocated to her hotel room after flooding issues closed Plaza Towers. 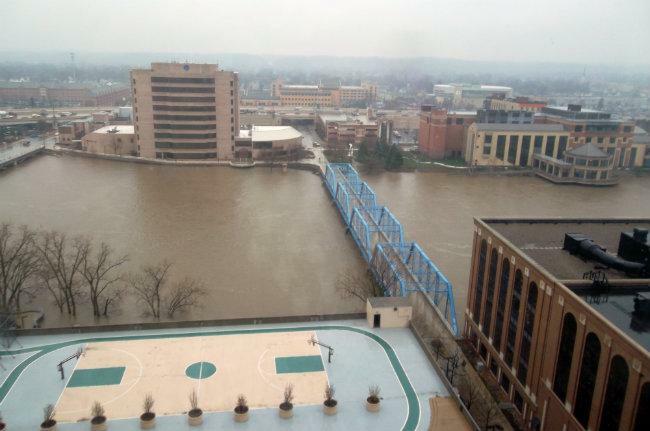 The view of the Grand River from Drew Woodrow's condo on the 16th floor of Plaza Towers. 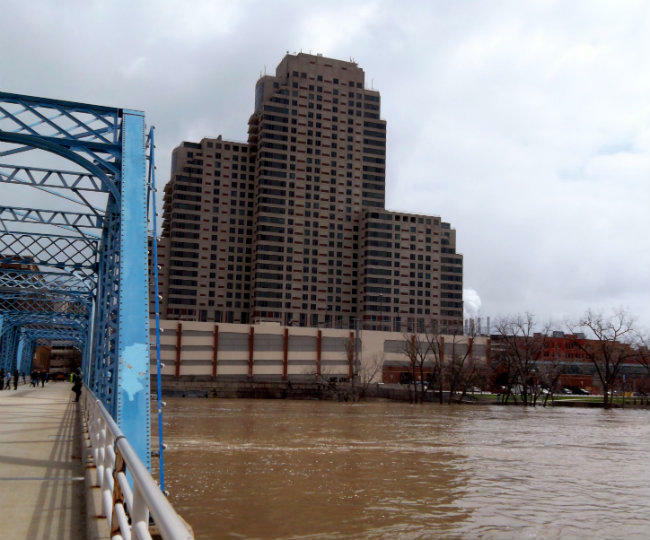 Plaza Towers was evacuated Saturday after about 5 feet of water filled the parking garage. Amber Jones and Kelsey Caverly work in downtown Grand Rapids. They were among dozens of people who came on their lunch break to watch the river rise that day. The two point to the river banks from a lookout point near the fish ladder. “I mean you can usually stand by that no fishing sign and now it’s practically underwater,” Caverly said. 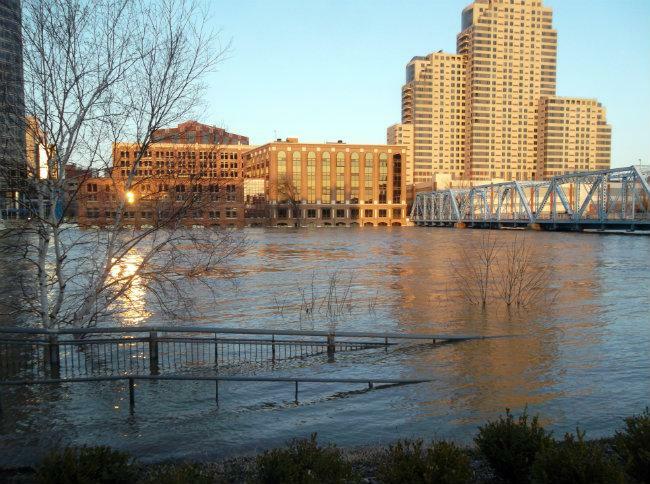 By Friday, downtown hotels and businesses were taking on water. At that point the biggest concern was sandbagging around the city’s wastewater treatment plant. It was processing around 150 million gallons of water a day, more than triple the usual amount. Grand Rapids Mayor George Heartwell asked people to conserve water. "If people were to cut by 10-percent, 20-percent it’s still just a fraction, but I suspect that every little bit helps so shower with a buddy,” Heartwell said with a smile to reporters during a press conference. On Saturday things got more serious, especially for residents of the Plaza Towers. The apartment/condominium/hotel complex is the second tallest building in Grand Rapids. Sometime around nine in the morning on Saturday the power went out. Someone came over the loudspeaker system once, maybe twice, eventually telling everyone they needed to evacuate immediately. “It actually reminded me of the scenes in Titanic where everybody’s grabbing stuff and running downstairs and talking about the water rising,” Eddy said. She and her husband made their way down the pitch black stairwell from the condo they rent on the 17th floor. “We could look down the stairwell and see the water rising in the basement. So that was, it was a little dramatic,” Eddy said. Upstream in Lowell, the river crested Sunday, flooding the bedroom community with water. Matthew Silverman also recalls a flood of gawkers. “It’s been really stressful. People were launching boats out of my backyard the other day, despite the warning to stay out of the water, despite the fact that two people already had to be rescued down by the river. It’s just, it’s been ridiculous,” Silverman said. Volunteers fill sandbags in Grand Rapids Sunday. But Silverman also says people banded together, working roughly 18 hour days for many days to help each other. Hundreds, if not thousands, volunteered to help throughout the region. 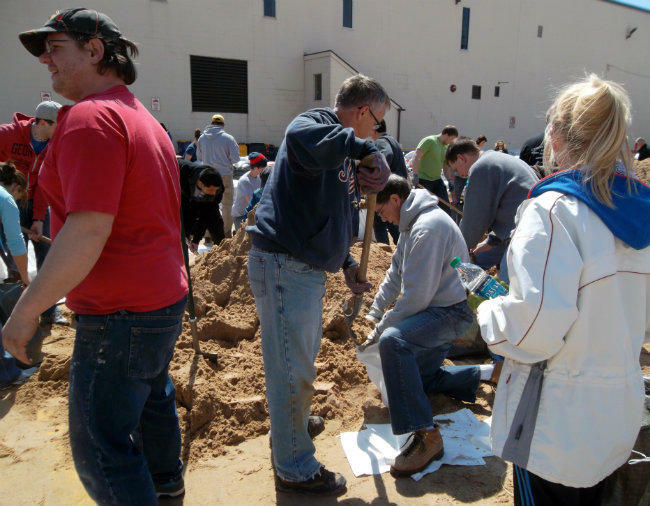 In Grand Rapids, volunteers filled close to 100,000 sand bags that people could take home for free. Others made light of the situation. 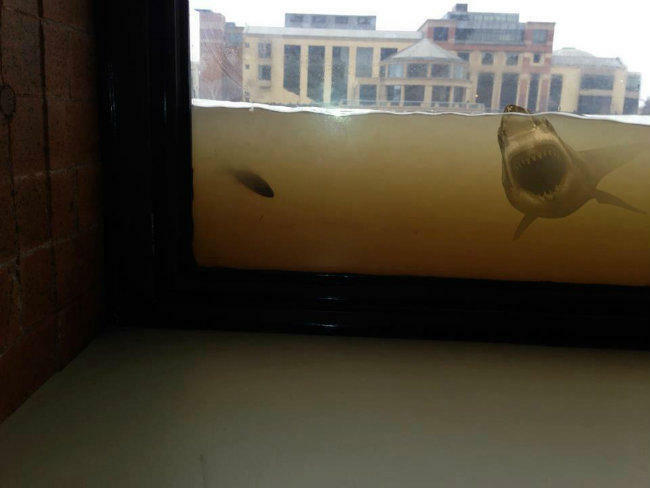 Pictures of fish looking into office windows that looked more like aquariums went viral on social media. Then people got creative with the photos. There’s the obvious Great White Shark from Jaws. But there’s also one with Olympic swimmer Michael Phelps, Sponge Bob Square Pants, Disney’s Nemo, and that naked baby from the cover of the Nirvana Nevermind album. One of many photoshopped images that flooded social media over the weekend. Mayor Heartwell’s “shower with a buddy” comment was played on probably every media outlet in town, spawning a facebook page “Heartwell Meanswell” with all sorts of inside jokes. 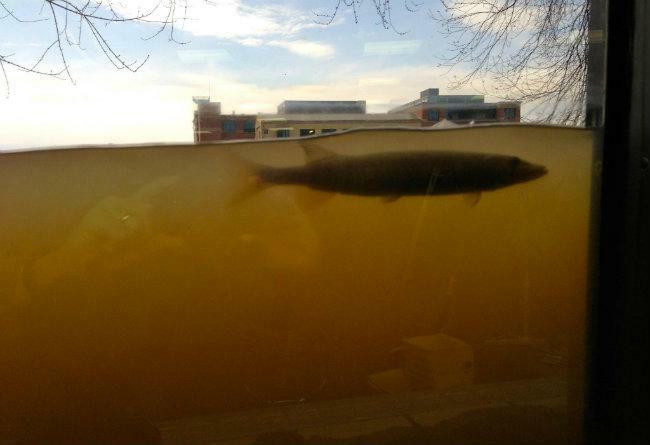 Most, but not all of the jokes, would only get a laugh from citizens of Grand Rapids. What’s next for governments, residents and businesses? Now that the water is receding, many people are beginning to clean up and assess the damage. 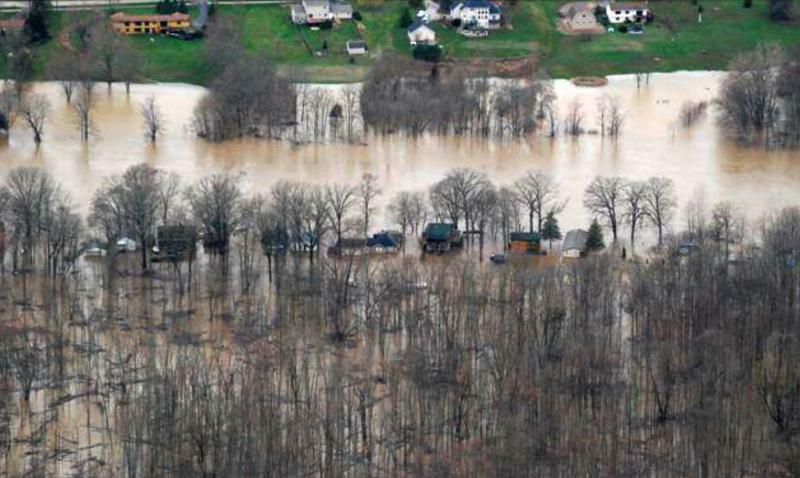 Kent County officials allowed more than a hundred people to return home yesterday. But more than a thousand people remain evacuated. Several hundred of them live in Plaza Towers. Drew Woodrow has no idea when they’ll be able to go home. So, armed with a flashlight, he headed up the 32 flights of stairs to pick up more stuff he needs to take care of his three month old baby. The building that houses Plaza Towers Apartments and the Courtyard by Marriott remain closed. Woodrow and fellow Plaza Towers evacuee Sheila Eddy emphasize no one should worry about them. They’re okay. He says his insurance company will not cover any costs. “They said because it was a result of a flood they basically said ‘I’m sorry,’ they sort of put their hands up ‘I’m sorry there’s nothing we can do for you,” Woodrow said. The city and Plaza Towers are still figuring out what exactly happened. They can’t do that until the river level and ground water get low enough that they can get into the parking garage safely. Twenty to thirty cars were damaged in the garage. Officials who own the property say they plan to reimburse renters for each day they’re out of their apartments. They also will hand out credits for spoiled food. Property owners have a rough idea how much the incident will cost, but are keeping them confidential. There’s a shared interest in resolving the flooding in Plaza Towers. There’s a 12-foot concrete arch sewer that runs diagonal to the parking garage. If the water in the garage is drained faster than the river recedes, more water could rush into the garage; along with soil that supports that sewer line. They don’t want to damage that sewer line because it could dump sewage into the river and cause bigger problems. “It’s a very intricate and delicate dance that we’ll be involved in here, but it’s one we believe we know how to do,” Grand Rapids Deputy City Manager Eric DeLong said. 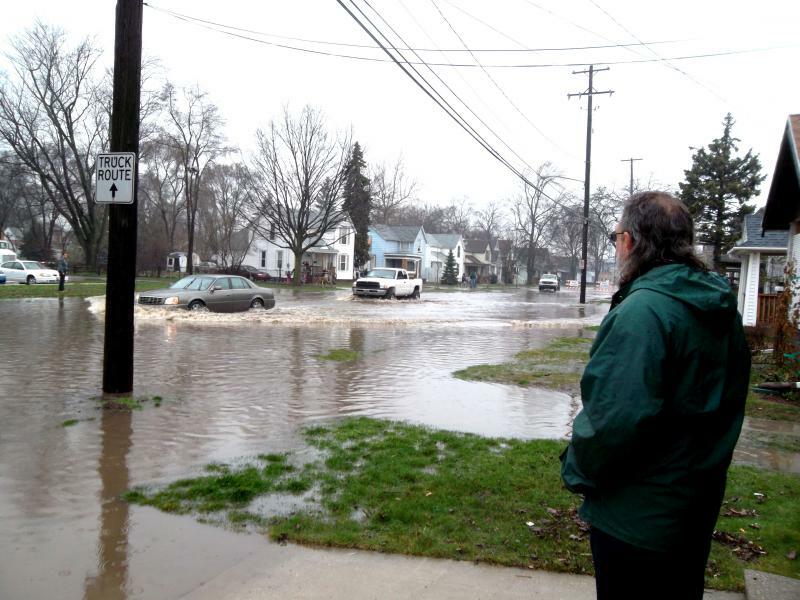 It’s still way too soon to even guess how much the record flood of Michigan’s longest river will cost residents, business owners or local governments.